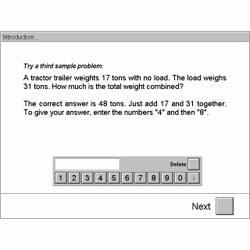 The test measures the ability to apply the basic arithmetical operations - addition, subtraction, multiplication, and division - quickly and correctly in "daily living" situations. The test is basically conceived for personnel selection, vocational counselling, diagnosis, and aptitude assessment. Additional areas of use are within clinical settings. Main areas of application: industrial and organizational psychology, and clinical psychology. Theoretically the test has to be placed in the borderland between a cognitive intelligence test and a test of knowledge. It contains numerical (N-factor) as well as verbal (V-factor) and logical (R-factor) components in the sense of Thurstones model for primary abilities. The knowledge element, the degree of daily training and routine influence the results on the test positively, but do not account for the dominating part of the variance. "Daily living" calculation tasks are presented on the screen in writing. For calculation purposes, paper, and pencil are provided. There is one test form containing 20 items. The number of correctly solved items constitutes the score for inductive reasoning. The printout shows raw and standard values for the total performance. The interpretation of the test results should be limited to the aspect of applying everyday living basic calculations. "Mathematical ability" is not measured by the test - a prediction concerning qualifications for the study of mathematics, or for curricula demanding a high degree of mathematical ability, is not possible. The split-half reliability coefficients vary between r =0.84 and 0.91 for respondents with different educational levels. The psychological validity is evident - the respondents think immediately of "Calculations, arithmetic". The logical validity is given by the operational definition of the task. Content validity has been proven through analyses of correlation with a numerical test. Prognostic validity could be demonstrated for occupations demanding, amongst other prerequisites, a high degree of perceptual speed and accuracy. Criteria used were "Completed occupational education without complications" and "poor performance on the job".